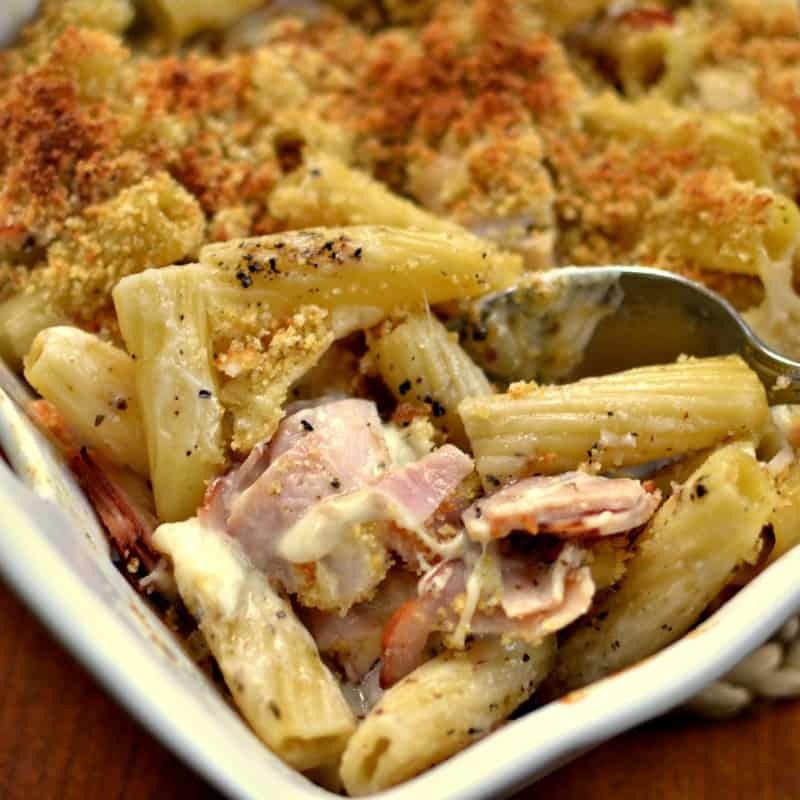 This Chicken Cordon Bleu Casserole combines tender chicken, sweet ham, Swiss cheese, rigatoni pasta and a perfect blend of spices in a cream sauce. 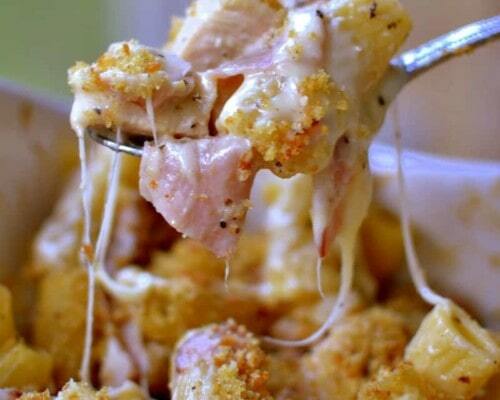 This Easy Chicken Cordon Bleu Casserole is sure to become one of your family favorites. 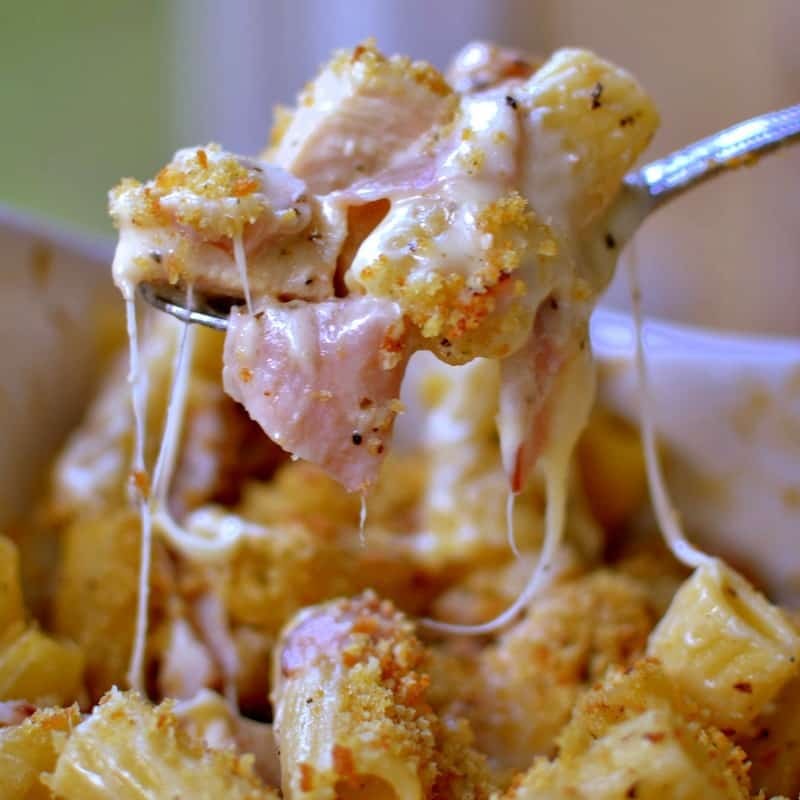 It combines tender chicken, sweet ham, Swiss cheese, rigatoni pasta and a perfect blend of spices all in a cream sauce topped with fresh ground croutons. How could anyone resist all this flavorful goodness packed into one beautiful casserole? This casserole takes no time to prep! If you can handle a couple of things at once you can prep this casserole for the oven in about 20 minutes. Cook pasta according to package instructions and drain. In large skillet cook chicken in butter until no longer pink inside. Remove chicken to plate and sprinkle flour into skillet. Cook for one minute. Slowly whisk in milk and spices and cook until slightly thickened. 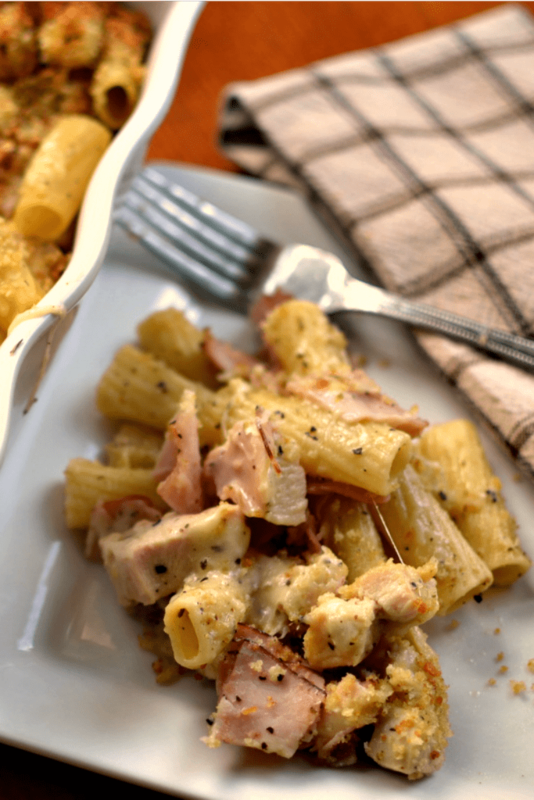 Combine pasta, creamy milk mixture, chicken, ham and Swiss in the casserole dish. In the final steps pulse croutons and sprinkle over casserole. Bake, turning on the broiler the last minute of cooking to lightly brown the crouton crumbs. How to prepare Chicken Cordon Bleu for a crowd. This Chicken Cordon Bleu Casserole is perfect for a party and can be tripled or quadrupled quite easily. It can handle sitting in a chafing dish, or over a chafer stand well. Purchase some low sodium chicken broth to keep casserole dishes moist in their chafing dishes during parties. Just stir in about 1/4 to 1/2 cup of chicken broth if the casserole starts to get dry over the sternos! I also cook the pasta al dente because the pasta will continue to absorb the moisture from the casserole and it will be cooked a little more if served in a chafing dish over sternos. What to serve with Chicken Cordon Bleu. This casserole is a meal in itself however if you like variety here are some awesome ideas. A cold glass of pinot gregio. Tomatoes and cucumbers tossed in oil and vinegar. Fresh grilled or baked garlic asparagus. Baked cauliflower with a sprinkle of Parmesan. What is bechamel sauce and what is it used for. Bechamel sauce is white sauce made with butter, flour and milk. Simply melt your butter, add an egual amount of flour and whisk cooking for about one minute. Slowly whisk in one cup of milk per tablespoon of flour. Keep whisking until the mixture is smooth and creamy. Bring to a boil and then reduce heat and simmer for about ten minutes to thicken and soften the flour. It is the key to making your dishes creamy like scalloped potatoes, mac n cheese and casseroles like this. I sure you hope and your family enjoy this pasta as much as we do. Bon appetit my food loving friends! This post was originally published September 2, 2016 and was republished October 14, 2018 with new content. 1/3 lb sliced deli Swiss cheese cut into bite size pieces. Cook rigatoni according to box instructions and drain well. .
Heat olive oil over medium heat. Cook chicken until lightly browned and no longer pink inside; approximately 6-8 minutes depending on the size of the cubed chicken. In same skillet melt butter over low heat, whisk in flour and cook for 1 minute. Mixture should be smooth and bubbling. Slowly whisk in milk until smooth. Add oregano, basil and garlic powder. Bring to a boil and then reduce heat to a simmer. Simmer for ten minutes; whisking a few times. Lightly spray small rectangular casserole dish with nonstick cooking spray. Combine pasta, creamy milk mixture, chicken, ham and Swiss in the casserole dish. Salt & pepper to taste. Pulse croutons in food processor or smash in Ziploc bag. Sprinkle over the top, Bake casserole for 25-30 minutes. Turn broiler on the last minute of cooking to lightly brown the top. Stay close by broilers are unpredictable. Your recipe sounds yummy. I wasn’t sure if the milk amount was 1 and 3/4 cups of milk or just 3/4 cup of milk? Thanks, I’ll let you know how it comes out! It is 1 and 3/4 cups of milk. Please let me know how it turned out! Thanks so much. I try to keep the ingredient list to more common ingredients. The key there is I try. I know that everyone does not have a huge food budget. Made this tonight and we loved it. For convenience, I used rotisserie chicken rather than browning raw chicken breasts. I didn’t have croutons so I used panko crumbs mixed with melted butter, and they worked very well. This is a delicious casserole that I will definitely make again. Thanks so much Carol! So glad that you liked it!! Love the combo of flavour—but I’m chuckling— where is the bleu of Cordon Bleu? A dish that is a must that never dies always good to cook every now and then! What an amazing dinner! My family will love this cheesy plate; delicious! I have been looking for a recipe similar to this that is easy to read. Thanks for sharing this, now I know what we’re having for dinner tomorrow night! Chicken Cordon Bleu Casserole are you kidding me!!! I am literally drooling. Thanks a lot for the recipe. You are most welcome Chad. I hope you enjoy it! This looks fantastic! I am always looking for some new recipes. Can’t wait to try this one! This has my mouth watering! The Bechamel sauce looks like it ties the whole dish together! I love pasta and this is another interesting recipe for me. Glad to learn something quite simple to make and practical. I love a good casserole! I’ll have to try this one out sometime. Looks like wonderful party dish. Can be cooked with your step by step recipe at hand. What a delicious looking dish! It looks packed full of flavour and goodness. My kids will love this! I guess this chicken recipe can’t be more perfect to impress upon guests coming for a weekend. I have never seen this done as a casserole before – but it looks so delicious! I am definitely going to be giving this one a shot. I never thought of making this recipe into a casserole. It looks sooo good! We love Cordon bleu! but I’ve never made the casserole version, it sounds very originally, cheesy and delicious!